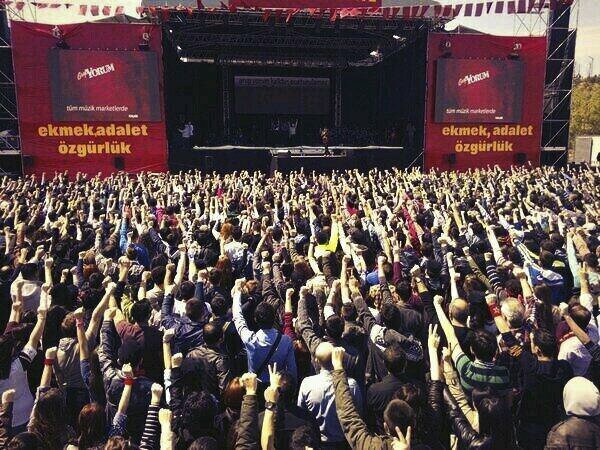 One of the largest concentrations of Turkish people opposing the Turkish regime, nearly 750,000 people, gathered on April 13 at the marketplace Bakirköy in Istanbul. Organized by the Marxist musical ensemble, Grup Yorum, this politico-cultural festival centered on denouncing police repression and the pro-terrorist, anti-Syrian foreign policy of Turkish Prime Minister Recep Tayyip Erdogan. Grup Yorum is an activist musical collective that suffered vicious repression by the Erdogan regime, its police and its media. Last year, Grup Yorum gave a concert in Tartous, a Syrian seaport town, to mark its anti-imperialist solidarity with the Syrian people. 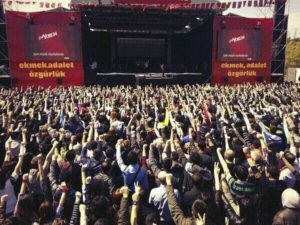 The families of eight young people killed during the protests last year against the Erdogan regime were invited on stage. A collective of artists sang “Van cold” (“Van üsüyor”) in solidarity with the victims of the earthquake of 2011 who are still forced to live in substandard prefabricated barracks, suffering from the indifference of the Turkish authorities. A delegation of Kazova workers, who had resisted by occupying a textile factory, was among the guests of honor of Grup Yorum. Several political and artistic opposition figures read a poem, sang a song or made a speech during the event. The Turkish attorney Selçuk Kozaagaçli spoke. He is famous in Syria for having investigated terrorist crimes committed by the Ankara regime. Kozagaçli Me, who had just been released with eight of his colleagues after 14 months of arbitrary detention, was there. From a report forwarded to WW by political journalist Kimyongur Bahar.